Rethinking your kitchen's styling? 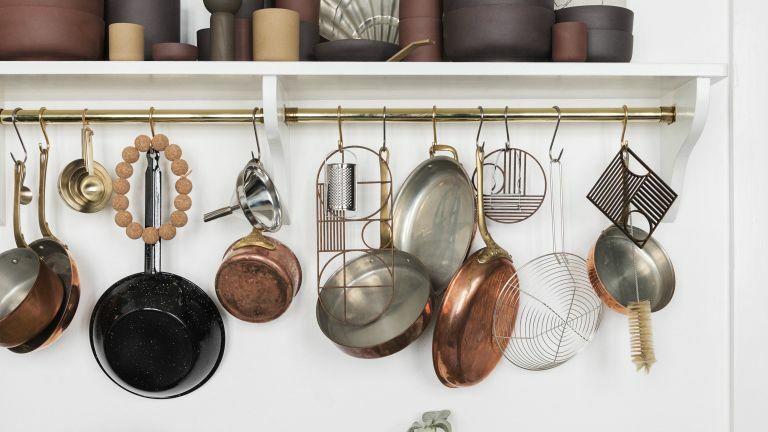 Move over stainless steel, copper is the metal of the moment, and what better place to inject some personality into your kitchen? Oh and if you have any more kitchen related questions beyond which copper kettle you should buy, we've got it covered in out ultimate guide to planning and designing a kitchen. French designers at La Cafetière have exquisitely designed this copper cafètiere, combining rustic charm with a chic contemporary look. Buy a set of copper mugs too for a proper copper coffee-party (they are great for serving up a Moscow mule too when you need a stronger brew). This copper toaster and kettle, is the perfect matching set to add subtle hints of copper around your kitchen. We love how the copper colour pops against the dark blue wall. Love metallic finishes in a kitchen? Well of course you do otherwise you would be here, so we reckon you should also check out these metallic kitchen ideas. If you're looking to create a statement in your traditional kitchen, a copper sink is a great focal point. This rustic, hammered design can be under-mounted or freestanding. It is also incredibly low maintenance and the existing patina will withstand wear and tear well. For more kitchen sink ideas, check out our guide. Time for a cuppa? Or a filtered water? This four-in-one tap really does it all. Providing hot and cold water, as well as filtered cold water and 100⁰C filtered boiling water – a quick cup of tea with the best quality water has never been so easy. Plus, this stylish U-shaped spout is so cool and contemporary. Find more boiling water taps in our guide. Want to add some copper hues but doing up a kitchen on a budget? Copper kitchen handles can totally transform the look and feel of a kitchen. Along with a few copper kitchen accessories, the handles in the Brayer Design kitchen work to tie the colour scheme together – a simple, quick and inexpensive update that makes a huge difference! Pendants always look gorgeous and they actually make for super practical kitchen lighting. These lights from Pooky add a subtle splash of copper and work beautifully against the dark kitchen cabinets. For more kitchen lighting ideas check out our guide. If you are loving all these touches of copper but want something that has even more of an impact then a copper splashback is for you. This one is made up of copper leaf glass tiles from Original Source, we love how it ties together all the other small copper accessories. If you want even mooore copper, choose copper as your choice of the best kitchen worktop material. In this deVOL kitchen, the glamorous countertop is the perfect match for the bared back simple Shaker-style kitchen cabinets. Copper pots and pans add a lovely rustic look to any kitchen, but we know they can get a bit pricey for the real thing. So if you are more into the look of copper pots than if they will actually last you a lifetime go and check out Croft Collection's hammered copper range for some affordable alternatives.